1970s: The Worm Farm, Skyline, Portola Institute & Where Is My 8 Foot Square Hollow Mahogany Pyramid? Does anyone know what happened to Richard’s 8-Foot Square Hollow Mahogany Pyramid? Last seen at the famous “Worm Farm” in San Greogrio. Thanks for putting such meticulous devotion into making something both beautiful and freely shared! I e-mail you now to ask whether you know, or know of anyone who does know, anything about an 8-foot square hollow plywood pyramid appearing at the Worm Farm in San Gregorio around spring of 1975? This exact proportional replica of the Great Pyramid was carefully built by me and left with the people living at the worm farm at that time. I am interested in learning what use this pyramid served, and what was its fate over the intervening years. If you, or someone to whom you can forward this message, could send me any information available on this subject, I would greatly appreciate the effort. I was happy to read such an upbeat email message first thing in the morning., I have a number of posts about the great magician Channing Pollock, owner of the unforgettable Worm Farm. POST (peninsula open space trust) bought the Worm Ranch from the heirs of Channing and Corri Pollock, who originally purchased the land from Stanford. George Cattermole and his wife own the Store in San Gregorio and they are certainly up-to-date on what is going on in their “front yard.” The water tank pyramid, if that is what you are referring to, stood just up the road from their store. Good to hear from you so soon. I have just one PIC of the pyramid from my days at the last avacado ranch in Yorba Linda, where I crafted it. As soon as I can scan it, I will send it to you. The name Channing Pollock rings a bell. It was likely by his magic I was drawn to leaving my pyramid at the worm farm – for no particular or clear reason of having any prior relationship with anyone there -as if he pulled me straight there through the aether, straight to San Gregorio bearing my gift of a precision wooden pyramid. I did not draw the plans for the water tank pyramid, but I did hear something of this project somehow. Perhaps at the Saturday morning Alan Chadwick organic gardening sessions held at UCSC back then. This may be why I considered the worm farm a good place to leave my pyramid as I left for Chicago. I had previously been living on Skyline Blvd. as the caretaker of the property know as Rancho Diablo, while it was still run by the Portola Institute (Whole Earth Catalog) to hold 20-25 people, 2&3-day educational seminars in the big mansion. 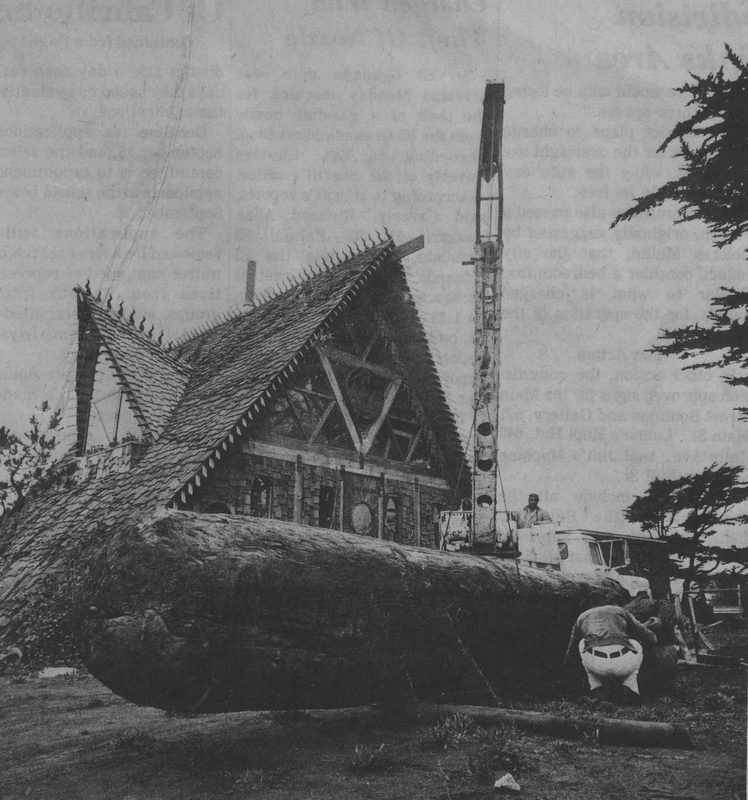 In the late 1970s, Princeton shipbuilder Manuel Senteio, arrived at Miramar Beach, driving his crane to move a 20-foot-long, 3000 pound redwood log to photographer/sculptor Michael Power’s healing center, then in development. Yes, it was VERY BIG AND VERY HEAVY–heavier still, from the sea water that had soaked into its pores. Could Senteio’s crane lift the thing? To fulfill Powers’ plan, which was to carve the log, it had to stand upright. Could this be accomplished? Nobody knew for certain. If all else failed, a crowd of Powers’ artist friends were on hand to help “psychically” raise the mammoth totem pole; its destination the peaceful inner garden. Half Moon Bay City Manager Fred Mortensen, a neighbor of Michael Powers, was there to lend more practical expertise. There were many oohs and ahhs and oh no’s. This was the most dramatic event to occur in Miramar Beach for many moons. But the crane lifter, Manuel Senteio was a professional: Can you hear the great burst of applause and laughter when the redwood log found its final resting place? Good Rumor: Who were the beautiful people at the Oceano Hotel? Friends have told me that they spotted some very rich, beautiful looking “hippies” staying at the Oceano Hotel in Princeton-by-the-Sea. I got excited and asked: What does a rich hippie look like? What were they wearing? What did their hair look like? How many of them were there? What are they doing in Princeton? Making a movie? But my friends are not in the business of asking rich hippies who they are, and what they might be doing in Princeton; instead my friends just looked and admired and loved looking and admiring these seemingly out-of-place people wearing perfectly made counter-culture clothes and beads from the 1960s. Now I hear that they were from a production company, involved with making a tv commercial for the “Hummer.” Hummers in Princeton? 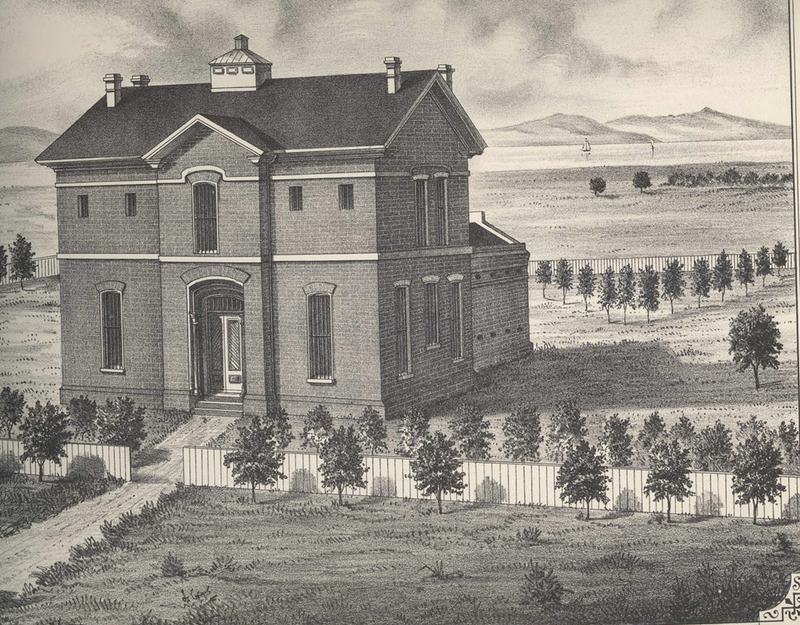 This is a wonderful drawing of the county jail in Redwood City, circa 1872. Has some institutional feel to it but it also looks like a country home; what do you think? From “The Illustrated History of San Mateo County,” Moore & DePue, publishers (1878). This beautiful book was “saved” and published by Gilbert Richards Publications, Woodside, California in 1974. 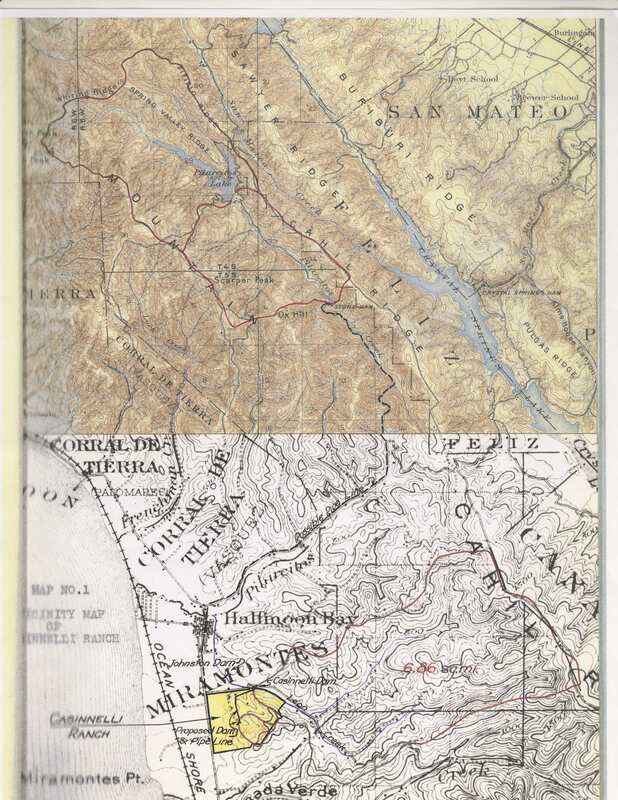 Look on the map below and find the land, Casinnelli Ranch; it’s colored yellow and there’s an arrow pointing to it, below the “Miramontes tract.” In an earlier WWII post, I mentioned Mr. E.J. Casinnelli as he owned 423 acres around the Johnston House. 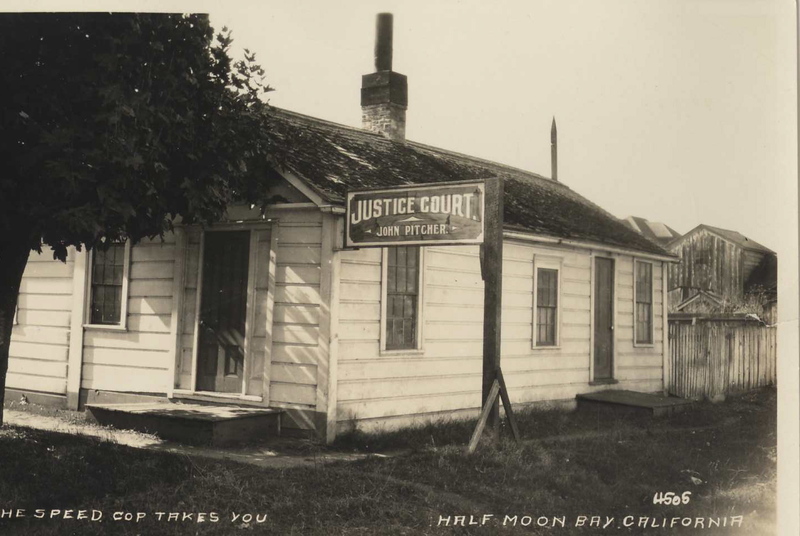 In 1931, the Cassinelli Ranch, south of Half Moon Bay, was being considered as a location for San Francisco’s City and County Jail in San Mateo County. There are several documents associated with the project that did not materialize. Some people will find the information contained within the reports enlightening so I will provide it here. The Cassnelli Ranch, comprising 423 acres, is located in San Mateo County, California, one mile south of Half Moon Bay. 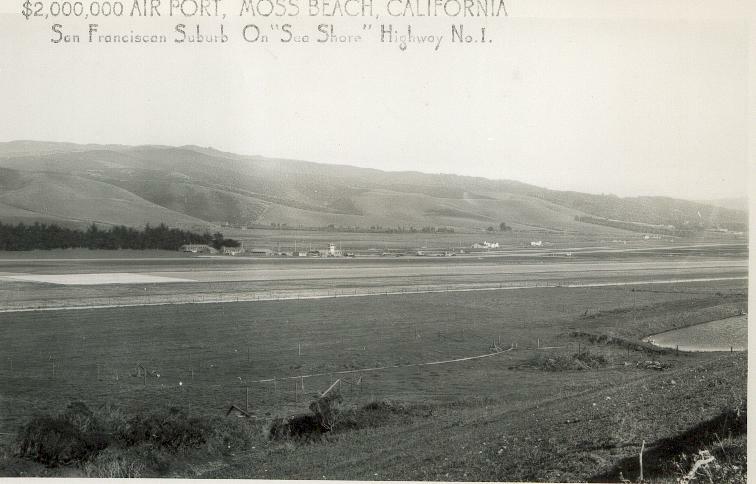 The west boundary fronts on the Half Moon Bay-Purissima Highway for a distance of over 1/2 mile. A surfaced road from the main highway runs along or adjacent to the north boundary for 3/4 miles. The western portion of the property, embracing approximately 200 acres, is flat land lying along the main highway. It merges into gently sloping land and then broad rolling hill slopes to a crest at the rear of the property. The topography is smooth and practically all of it is clear of brush, giving excellent visibility. All but a small tract in the northeast corner has been under cultivation for many years. A portion of the flat land has been planted in artichokes and miscellaneous vegetables, and the remainder and the adjacent hill land in hay and grain. The artichokes are irrigated every season and vegetables when water is available. Leon Creek flows through the Ranch near the northeast boundary for a distance of 3095 feet, where it has a cut channel approximately 35 feet deep and 100- to 200 feet wide. This stream is a tributary of Pilarcitos Creek, joining it at Half Moon Bay about 1-1/4 miles below the Ranch and flowing thence to the Pacific Ocean, a distance of 1-1/4 miles. Thank you, Tony Pera, for the photo. Tony, almost single-handedly returned the Ocean View Lodge in the IOOF building on Main Street, back to its former glory. You can’t imagine how many hours and days of his private time he gave up to complete this major project. He’s so special, a rarity, the kind of community-minded fellow who was more prevalent in earlier times, when people got together to help a family in need, or to rebuild a house that had burned–Tony’s a man who really cares about his community, and all I can do to show my appreciation is to honor you in this blog space. Sometime in the first part of 1942, before my brother left for service in the US Army in October, government men came to our home in Moss Beach. My brother, Raymond Martini, recalls they showed some official papers, but said they were not given to the family to read, and we do not know if they were FBI or what was then called G-Men. My Dad was not a citizen; he was born in Brazil, though of Italian heritage. He came to America from Italy; the family returned to Italy after a few years in Brazil, where they had gone to find work. My dad and one brother were born in San Paolo, Brazil. I do not know what these men said exactly, but the family was told that my Dad had spoken well of Mussolini. When my Dad came to America at 16, sometime in 1913, he probably did have a good opinion of him. it was much later that Mussolini became more of a controversial, political figure. When my husband & I toured Italy in the mid-eighties, people said Mussolini had done well for the country when he first came to power; he did similar things as our president had done; he built up the roadways, trains, etc., had tunnels constructed through the mountains and opened up Italy to travel and transportation to France and Switzerland. Additionally, this gave work to the men who were unemployed. My Dad never returned to Italy after he came to America. I can say, he never spoke to us about the Italian government, or said anything particularly favorable about it. He neither wrote or read in either Italian or English; he probably did not know a lot about the situation in Europe. My father was certainly not a political type of person. He was just a hardworking man raising his family. I remember being in my bedroom and my Mom came and said we needed to get into the living room as these men had arrived. There were at least 2 or 3 of them, and they wanted us all in one room. They proceeded to search the house. We did not see a search warrant, or anything else, to indicate they had official status to be there there. Maybe, during the war, it was not necessary, and I am sure my parents did not ask about it. We were all rather afraid of what was going to occur. Additionally, they might have been looking for a shortwave radio. Mainly, they found some rifles that belonged to by brother, as he was an avid hunter. One rifle might have been my Dad’s; he was a farmer, and they were allowed to shoot rabbits that ate the crops. My brother took responsibility for the rifles so they would not cause any additional problems for my father. Mostly, my older sister, myself and my younger sister were sitting in the living room, and what transpired was related to me, later, by my Mother. She felt that someone who may have been upset with my father over something, probably had reported him to the authorities. Finally, after quite some time, my brother, who was visibly upset, reminded the ‘G-Men’ that he had enlisted in the service and would be leaving for the army air force. He asked: Did they feel my dad would send messages to the enemy so they could sink a ship that would be taking his own son to Europe to fight? The government men had no answer for my brother’s question. They left and we never heard from them again. There was also a successful exhibit called “La Storia Segreta” that traveled the United States and was well received at the courthouse in Redwood City. I wrote this shocking story in 2003. It was a frightening time on the Coastside. If you were Italian in Half Moon Bay at the beginning of World War II–and didn’t have citizenship papers–there was a possibility of danger and humiliation. At the time was broke out, Half Moon Bay was a close-knit farming community and Main Street was the hub of the small town’s commerce. The locals shopped at the same stores, ate the familiar restaurants, raised their glasses at the saloon, prayed at the beautiful Catholic Church and sent their kids to the grammar and high schools. But all that changed after the Japanese bombed Pearl Harbor on December 7, 1941. 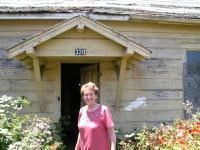 Today (2003) “Jo” Revheim is a retired nurse, a widow and longtime Pacifica resident. At the start of the war, she was the 15-year-old daughter and only child of farmer Antonio Giurlani and his wife Marianna. The Giurlanis grew sprouts and chokes on land adjacent to the old Catholic church that once stood west of Main Street. In between masses, Jo helped tidy the church, and she recalls ironing shirts for the much-loved Father. The Giurlanis had come from Lucca, Italy, but Jo’s mother was actually born in Marseilles, France. Still, everyone in Half Moon Bay considered her Italian. Soon after the army trucks rolled into Half Moon Bay, Josephine remembers, her father received an offical letter from the U.S. government ordering the family to move to the east side of Main Street. They were also required to register in San Mateo. Why did the officials select Main Street as the place to draw the line, separating east from west? Main Street was the Highway 1 of its time, and everything to the east, including the beaches, was off-limits to those folks without citizenship papers. 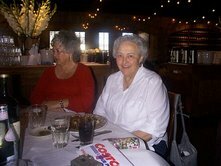 Josephine recalls that the grocery store, the bakery and everything else was on the west side. The east side was where people lived, and unless you had a relative to help, there was no place to move to. Printed notices ordering all “aliens, German, Italian and Japanese” to re-locate were plastered on telephone poles in the town. The Japanese were rounded up and detained at Tanforan racetrack in San Bruno. Their history is well documented. But in Half Moon Bay, Josephine notes, there was no central location for the Germans and Italians. After registering in San Mateo, they simply had to leave their homes on the west side. The while line painted down the center of Main Street not only separated east from west, it made some lcoals suspicious and fearful of those who did not have citizenship papers and had been pushed away. A person who had been your friend a week earlier might turn sullen and threatening. “We were never to cross that white line!” Josephine exclaimed today (2003). Crossing meant that they would surely be reported and possibly dragged before the local judge, or worse. Fortunately, not everybody was mean. For example, Judge Manuel Bettencourt, was kind and showed compassion when dealing with non-citizens. But there were exemptions to the order, and Jo says since she was younger than 16, she was not required to move. Neither was her mother, being French. The order was clearly aimed at Jo’s father, an Italian with no papers and little education. The decision was not difficult. Whatever the hardships, this family would stick it out together. How many families faced similar circumstances? Jo estimates some five to ten Half Moon Bay families were in the same boat. In instances, where some family members had papers, and some didn’t, they had to decided whether to break-up or cross the white line together. There’s the story of one family that operated a business on Main Street. The parents, without papers, had to shout instructions to their citizen children across the street. How could this happen? How could a white line tear apart the social fabric of a small farming community? The attack on Pearl Harbor had created an atmosphere of near panic. It’s no surprise that people on both sides of the white line were faced with impossible decisions. Would the Japanese invade California? Military experts had long recognized the logistical importance of the Coastside. 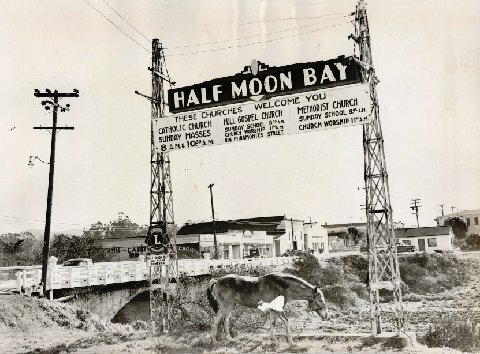 In the late 19th century they warned that Half Moon Bay could prove to be a “back door” for a foreign, hostile fleet. The enemy could land at Pillar Point and march, without resistance, conquering all of San Mateo and San Francisco. After Pearl Harbor, desperate measures were taken to protect the Coastside, to close that vulnerable door. The military patrolled the beaches, bunkers were built–some of those WWII relics can be seen today from Highway 1 near Devils Slide–and gun emplacements dotted the hills overlooking the Pacific. Local citizens volunteered to scour the beaches looking for submarines and scn the skies for enemy aircraft. Meanwhile, Josephine’s family dealt with their own emergency, scrambling to find a roof to put over their heads. The government had given all the aliens a two-week deadline to relocate. The Giurlanis had to harvest their crops and move everything they had, including the goats, chickens, rabbits and horses. Incidentally, they were prohibited from taking radios and guns. As the two-week deadline crept closer, it was like a noose tightening around theirs. Then a fortuitous turn of events. 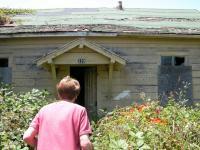 The old house was vacant, and the local kids were convinced it was haunted. “Finally, at midnight, the deadline time for the great move,” Josephine says, “we loaded up all our belongings and animals and made our way through town and landed in the Johnston House. Most important, the house was located on the “East” side. They were on the wrong side of the street for the Giurlanis. The school was also on the west side, and she couldn’t go there. The most humiliating part of the whole experience for this teenager were the stares and unfriendliness she and her family encountered. There were times when the Giurlanis were able to circumvent the restrictions. On one occasion Josephine and her mother harvested the artichokes at their farm on the west side while her father, prohibited from going himself, waited in the car on the east side. They got the chokes back to the Cassinelli ranch where they were crated and sent to market in San Francisco. Some of her remembrances are so unpleasant that Josephine is uncomfortable even thinking about them today. 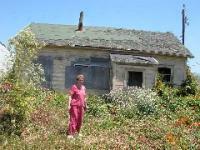 She quirms when recalling that one malicious neighbor actually reported her mother’s visits to the farm on the west side. Even though she was French she had to appear before Judge Bettencourt to prove she wasn’t subject to restrictions, and the good judge reassured her of her exempt status. The worst recollection of all was of her mother successfully fighting off an assault by some angry, unthinking local. As to those German non-citizens on the Coastside, Jo had no information. The Giurlanis were back in the house and it wasn’t long before they received a letter from the U.S. government advising them to become citizens or face deportation. They all got their citizenship papers. For a time, the family continued to farm the land beside the old Catholic Church. Later, they moved to Pacifica, where Jo’s father worked in construction for the developers Doelger and Oddstad. 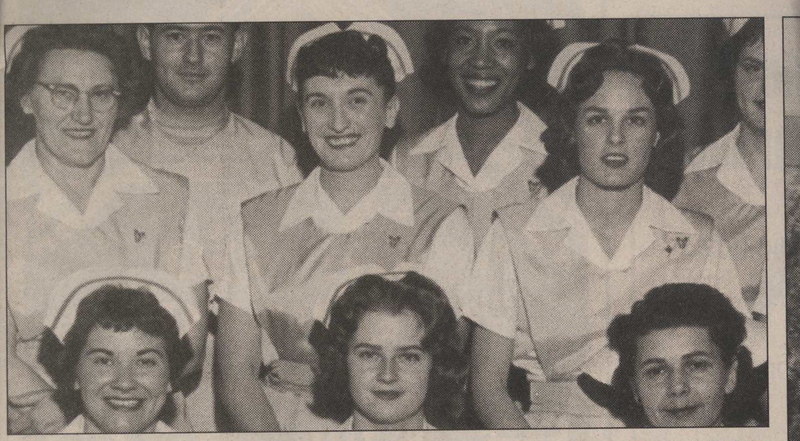 Josephine married, became the mother of three children and attended the College of San Mateo, earning her degree as a licensed vocational nurse in 1963. She spent 15 productive years working on the eighth floor at Peninsula Hospital in Burlingame. When Jo’s parents fell ill, she tended them with great love until the end of their lives. Jo Revheim still has friends in Half Moon Bay and visits regularly. One source of constant amazement to Jo is how magnificent the Johnson House appears today, compared to the hovel she lived in with her parents more than half a century ago. She takes particular pride in the help she provided to the Johnson House Foundation when they asked her for sketches of how the house looked in the 1940s. Shortly after my interview with Josephine Revheim, we took a ride to Half Moon Bay to see the house she had lived in as a 15-year-old before her family was ordered to move out of it. 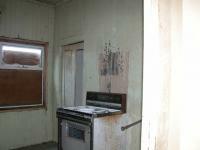 Surprisingly the house was still standing, but it was vacant and uncared for, with broken glass on the floor, grafiti on the walls, empty paper coffee cups, somebody’s crash-pad, and, right there, in the middle of town. Here are some photos from that day; arriving at the house, looking at the washing machine inside. Josephine is the lady in pink. From the Half Moon Bay Review, 1945, an article celebrating the end of hostilities. “Japanese capitulation, ending World War II, has lifted the wall of military secrecy on San Mateo County’s magnificent contribution to the fighting machine of America and her allies in mankind’s greatest conflict of arms. “It was no small part that we of the Peninsula played in winning the victory over Nazi Germany and a Japan bent on world conquest. And it was no small peril in which the the county, as key to the defense of San Francisco and the metropolitan bay area, found itself when the foe threatened invasion of our shores in the dark years of 1941-42. “Ships launched in South San Francisco helped beat the submarine menace in the Atlantic and Mediterranean. “Parts turned out in small factories in San Bruno, South San Francisco and San Carlos and other parts assembled in San Mateo, helped produce the miracle of radar that enabled our fighting ships to detect enemy aircraft and send up planes to intercept the foe approaching shores of our allies. “Millions of gallons of aviation gasoline and tons of ammunition were funneled through Port Redwood City to power our Pacific aircraft and provide the shells that pounded the enemy into submission. “A thousand other vital instruments making up the mightiest war machine in history were made here. “Lastly, parts used in the manufacture of the most terrible weapon ever devised by man–the atomic bomb which brought on Japan’s surrender, were turned out in a San Carlos laboratory. “Mills field navy installations totaling $5,000,000 are to be turned over to San Francisco and 85 acres of the property will be promptly leased to Pan American Airways as its Pan-Pacific terminus. “The explanation was made by Capt. Bernard M. Doolin, airport manager, in clarification of the navy’s announced intention to abandon its facilities at the field. “At the same time the navy further announced it will the north of Half Moon By air strip, one of the erstwhile secret installations of the war. “Both actions are expected to take place by June 1946. “According to earlier agreements, Doolin said, the navy has agreed to hand over to the city property and $5,000,000 of improvements within two years after the war. The contract for lease of the acreage to Pan American has already been signed. “The arrangement was unique, said Doolin, and was done because the city wanted Treasure Island as an airport and the navy demanded it as a base. The army made similiar use of the field with the same understanding. The government paid for $10,000,000 worth of improvement, Doolin said. In November, San Francisco taxpayers will vote on a $20,000,000 bond issue to complete the Mills Field expansion program. “Installations at Treasure Island, declared surplus, meanwhile, will either be offered to another naval bureau or air operations will be reduced, said naval spokesman. Around the same time the “blackout resolution” was repealed by the County War Board.